​WE WILL TAKE OUR GRIEF AND TRANSFORM IT INTO SOMETHING POSITIVE FOR OTHER PEDIATRIC CANCER FAMILIES. HOPE. ​Join Us in the Fight Against Childhood Cancer. My daughter Briana was diagnosed with leukemia on July 2016. Sarah's Fight for HOPE surprised my daughter with special gifts. We truly appreciate everything they have done. We even received tickets to Red Bull's soccer game. She also participated in the Halloween costume donation that was held The Valerie's Fund center at the Morristown hospital on Sept 21, 2017. God bless all that make these things happen. They put smiles on our children faces. We thank Sarah’s Fight For HOPE Foundation not only for the financial assistance that is vital to families coping with pediatric cancer treatment, but also providing activities and gifts that help kids in treatment just be kids. This past Halloween, Sarah’s Fight For HOPE Foundation provided boxes of Halloween costumes sized for infants through young adults. The patients were so excited to search all the costumes and find one of their own. Some of them dressed up in clinic and wore the costumes home. Their delight was infectious. For many of our parents who are financially stressed by medical bills and the associated costs of treatment, not having to buy a costume and seeing their children so happy was a most appreciated gift. During the December, 2017 holidays, Sarah’s Fight For HOPE repeated their smile-making activities when they visited clinic and brought gifts as well. Again, during the most stressful of times, the unexpected kindness of the foundation was most appreciated by our patients and their families. My daughter, Gabrielle, was diagnoed with T-Cell ALL on August 31, 2017. 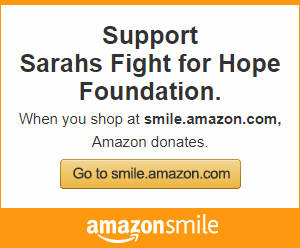 Sarah's Fight for HOPE Foundation got in touch with me through the Valerie Center at Goryeb Children's Hospital. They were so touching and made me feel like family right from the start. Yesterday, Gabby received a generous basket and a donation from the Foundation. After all that this family has been through, they took something that must have been so difficult for them and have and will continue to make others who must go through this horrible disease, so special. I pray for this family and this Foundation and thank Ingrid from the bottom of my heart for making Gabby feel so happy yesterday.